Hello everyone!! It's been an interesting two weeks here in STCW headquarters. And by "interesting" I mean "full of germs". I came down with a cold last weekend, then spent all day Wednesday laying on the couch unable to move without being super dizzy. Thursday I felt totally fine though, so it must have been a weird passing thing. It meant I didn't get as much work done as I wanted, but I did manage to finish up 3 colors worth of restocks for the update this week. I've got more patterns for you this week! First up in Undulance, by Suzanne Bryan, which is published in the Feb. issue of Cast-on. 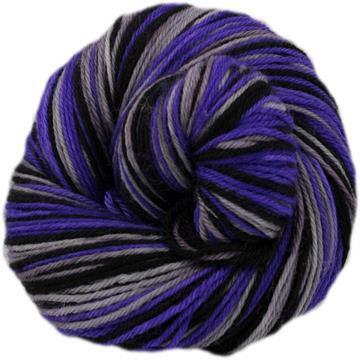 Designed to work with my yarn, it was oringally written with Cassiopeia, but will also work perfectely with Resistor, X-Ray and the Feb. club color, as they all have the same striping pattern. If you want to knit this up in the pattern color, no worries, I've got a huge batch of Cassiopeia in the works that should (fingers crossed) be finished by the next shop update. Next is a pattern I never would have thought would work until I saw someone had knitted it up in our 15 in 15 kal group on Ravelry. 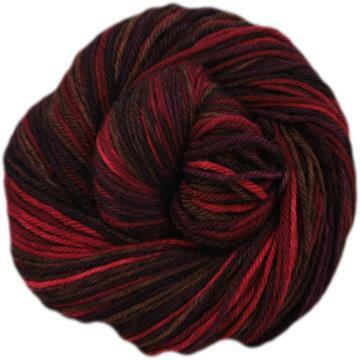 Shetland Ruffles is a rectangular scarf/stole that works wonderfully in a self striping yarn. Use the pattern as written with one of my 2 or 3 color stripers, or make it narrower like jeanniefanihi did and use a complex striper for one completely awesome scarf. I really need to finish some WIPs to cast on one of these--my only dilemma now is in what color! I've been getting a lot of questions lately both on social media and in my inbox about what yarns I think are best for socks, so I thought I'd do a quick response here so everyone could see. I, personally, believe that all the yarns I carry work perfectly in socks, and have knit socks with almost all of them (I haven't gotten to Harmonic yet, between dyeing and a toddler I've run out of time!). In the above photo are 3 pairs of socks I've made out my yarn that I've worn frequently since I made them. These are photos I just took, right before writing this newsletter. 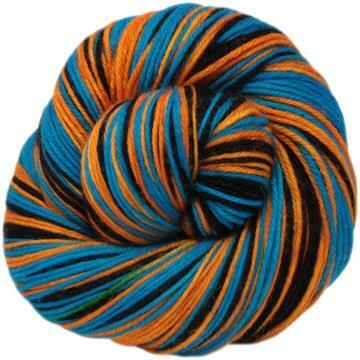 The above left (Large Hadron Collider, Continuum base) I knit in Feb. 2011, so they are 4 years old this month. They're the most worn, because the sock on the far left got thrown in the washer on hot by accident. It survived the trip (as did the person who washed them), a little faded and a little shrunk, but still wearable. The middle socks (Binary System, Relativity base--similar in content to Time) I finished at the beginning of 2012. 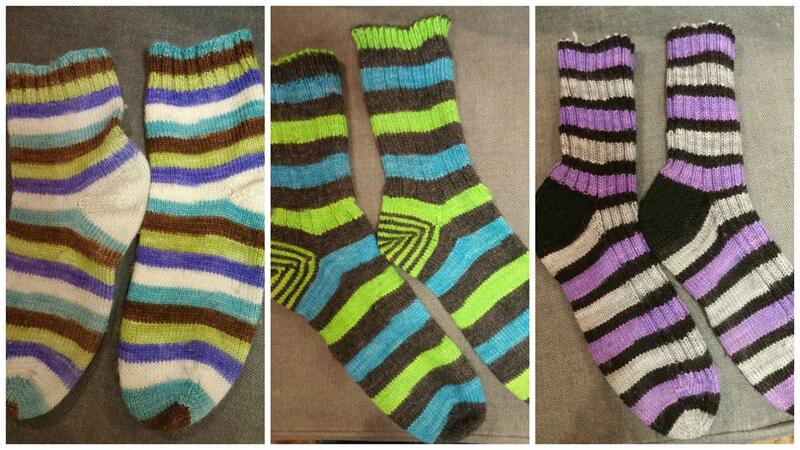 The far right socks (S.E.U, Continuum base) I finished in June of 2012. For the Continuum pairs, there's occasionally some pilling on the bottom of the foot and the back of the heel, especially if I've been wearing ill-fitting shoes, but I just use a sweater shaver to take off the pills and they look good as new. I hand wash all my socks in Euculan, spin the excess water out in my washing machine, and lay them flat to dry. I haven't, as yet, worn a hole in a single pair. Depending on how you care for your socks, and if you tend to be hard on socks in general (I'm not, I still have store bought socks from highshcool), your socks should last a good long time. You're recieving this email because you have either purchased yarn from my website in the last 2 years or have signed up to get the newsletter either through my website or on Facebook. If you do not wish to get this emails, simply click the unsubscribe button at the bottom of this email.